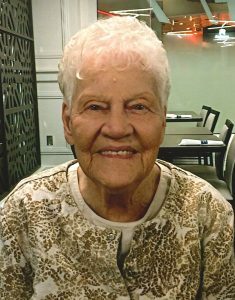 Age 85, of Grand Ledge, MI, passed away February 3, 2019, in Grand Ledge. She was born September 17, 1933, in Lansing, MI, to the late Wilhelm and Dorothy Bockbrader. She worked at the MSU Laundry, retiring in 1991. Caroline is survived by her daughters, Deanna Casaday and Janine (Dave) Runyon; daughter-in-law, Penny Bensinger; eight grandchildren; nine great-grandchildren; a brother, Ed Chaffee; and a sister, Pat Bolen. She was preceded in death by her husband, Dorwin “Shep” Shepler in 2012, son Tim Bensinger in 2008, and son-in-law Fred Casaday in 2009. There will be no services, in lieu of flowers memorial donation may be made to Great Lakes Hospice. Arrangements are by the Estes-Leadley Greater Lansing Chapel. Heavens I could hear the faint flutter of your wings as you left. Sorry to hear of Caroline’s passing. I always appreciated her. She was so good to Dorwin. May your good memories help with her passing. Letting you go was the hardest thing I have ever had to do! You filled my life with so much Joy and happiness! I will never say good bye. I will just say until I see you again. You will always be my angel! I miss you so very much !! Be as amazing in heaven as you were on earth . You was my angel on earth …. and I know I gained one more angel in heaven ! !